Although it has less memory and storage than the recently introduced black variant, this custom BlackBerry KEYone comes for about US$816, while the standard model without gold plating retails for around US$528. BlackBerry KEYone has been available for a while, and it even received some hardware improvements after some tests revealed that the build quality of the first batches was not as good as it should have been. 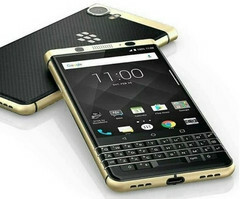 However, the gold-plated edition in question now only comes with external changes, but it appears to be the most expensive KEYone currently on the market. While the black edition that was recently unleashed in India has 4 GB RAM and 64 GB internal storage, the BlackBerry KEYone Special Gold Plated Edition is based on the regular variant and only has 3 GB RAM and 32 GB internal storage. This gold-plated BlackBerry KEYone can be pre-ordered from Axion Telecom, an online retailer located in Dubai. Its price tag reads AED 2,999 - around US$816. Those who place their orders today should get the handset in about a week. The price of the regular BlackBerry KEYone in the US is around US$528.